Recover Whatever You Have Lost. Do Your Data Recovery for Mac Professional, a reliable and safe Mac data recovery software, helps you easily and quickly recover lost files from a Mac notebook, desktop, Mac-based drive, digital device, or removable device due to deleting, formatting, virus attacks, OS crash, improper operation or other unknown reasons. This Mac file recovery software can scan your device sector by sector to find everything you've lost. It can not only recover deleted, formatted, inaccessible data, but also retrieve lost data from deleted or lost volumes/partitions. Just with 3 steps, you can get all lost files back. Do Your Data Recovery for Mac provides two recovery modes – Quick Recovery and Advanced Recovery to ensure finding all lost files. While Quick Recovery can quickly find the deleted or recently lost files, the Advanced Recovery will scan your device deeper and find many more missing files. Recover lost data from not only a Mac computer, but also a digital device, SD card, USB drive, Memory Card or other storage device. Support to recover raw files. Convert HD/SD video files in batches, Rip DVD movies and download YouTube online videos on Mac with ease and speed. 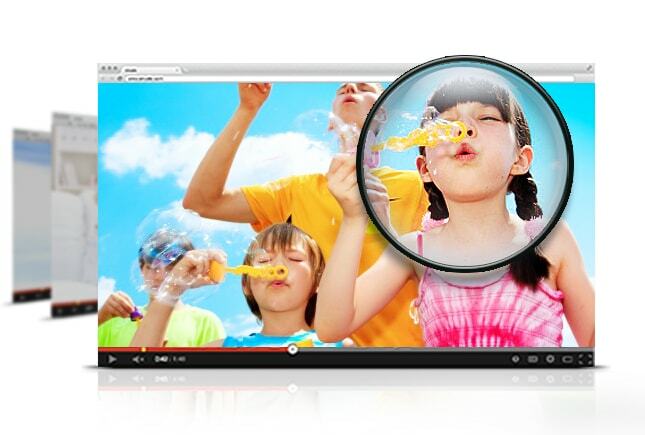 Cisdem VideoConverter for Mac provides you an all-in-one solution for video entertainment. It allows you to convert videos & audios from and to all popular formats, extract soundtracks from video files, rip DVD movies, and even download videos from popular online video sites. You can also perform basic editing tasks such as trimming, rotating, cropping, adding watermarks and subtitle with external .srt, making 3D videos, and much more. It's nice when we are able to watch online videos while at the same time download online videos directly from YouTube and other popular sites. With Cisdem VideoConverter you can easily download and convert HD 1080p videos from YouTube, Vimeo, Metacafe, Dailymotion and many other online video sites and save it as FLV, MP4, MP3, WebM, AVI, FLV, etc. formats in bulk with lossless quality on Mac. Designed to be intuitive, Cisdem VideoConverter is more than a Mac video conversion program, it provides some simple video editing functions for you to trim/crop/rotate media files and convert any selected section of your movie, add image/text watermarks to video for copyright protection, Load subtitle with external .srt for better understanding, adjust video effects to customize the video, Make 2D videos into 3D for enjoying wonderful movie effects with your 3D glasses at home. etc. Combining De-interlacing Engine with advanced High Quality Engine Cisdem VideoConverter gives you both high quality video and Dolby AC3 5.1 audio! It fully supports lossless conversion for most popular video formats like MOV, MP4, M4V and more. Video and audio synchronization is promised. 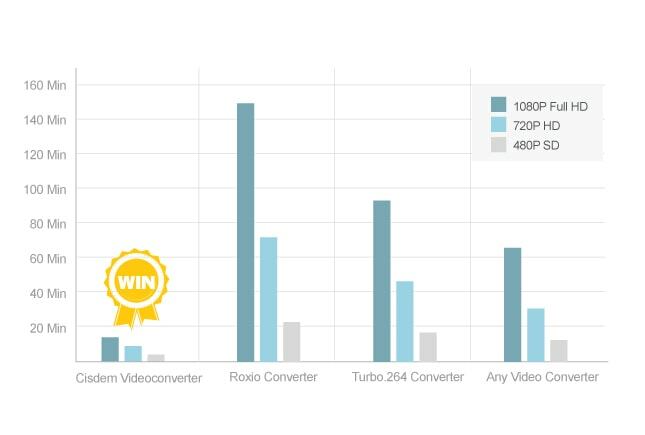 With extremely fast download and convert accelerator built-in, every video you put into Cisdem VideoConverter is converted as rapidly as possible – even during batch conversions of multiple files simultaneously. Some formats even processed 56x faster! Download the program and check it out for yourself. - OS X 10.7 Lion, OS X 10.8 Mountain Lion, OS X 10.9 Mavericks, OS X 10.10 Yosemite, and OS X 10.11 El Capitan. The Easiest and Fastest Batch Audio Converter. Check out the ZotShop for more special offers! Easy Audio Converter for Mac lets you quickly and simply batch convert between almost all popular audio formats. Supports audio file types including MP3, WMA, WAV, AAC,M4A, FLAC, OGG (Speex,Vobis), AMR, DSD, and among many others. Easy Audio Converter for Mac will also extract and convert the audio content from video formats including: AVI, FLV, MOV, MP4, MPEG, WMV, MP4, M4V, SWF, VOB, MKV, WMV, RM, RMVB, TS, MTS, ASF, NSV, OGM, and more. You can even transfer uncommon file types to MP3 so they’re fully compatible with any platform. The app provides full iTunes integration and lets you edit the album, artist and track information. Convert audio files between almost any formats, including MP3, WMA, M4A, AAC, AC3, MP2, WAV etc. Extract audio tracks from videos like AVI, WMV, MPG ,MP4, VOB, FLV, SWF, RMVB etc. Gives option of setting encoder property like sample rate, bit rate, channel. Excellent output quality, Super-fast speed. Support copying metadata from original files to output audio, including album artwork, artist, lyrics, etc. Edit album, artist and track information. Simple to use – drag, drop and click convert – Easy Audio Converter looks after the rest. Export supported encoded files directly to iTunes library with custom iTunes playlists. Convert Audio file to MP3, AAC, AC3 etc so that can be played on iPad, iPhone, Android devices, and other MP3 players. Cisdem PDFConverter can convert PDF to Microsoft Word(.docx), PowerPoint(.pptx), ePub, RTFD, Text, HTML, Keynote, Pages, Images, etc. with all original features preserved to keep you from wasting hours reformatting documents with complex layouts and graphics. Complete with the most accurate fully-formatted text content, layouts, formatting, columns, tables, and graphics. Besides, you can preview the PDF files in thumbnail mode and choose to convert several pages or the whole PDF files. Change PDF to Microsoft Word (.docx) for flexible editing or content reusing. Convert PDF files to stunning presentations (.pptx) in minutes. Copy text content from PDF to Text (.txt) or Rich Text (.rtfd) without retyping manually. 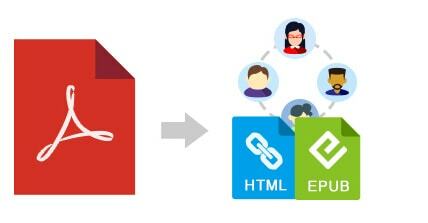 Convert PDF into HTML so as to publish and share PDF content on the web. Turn PDF to EPUB for better enjoying eBooks on EPUB-friendly devices like: iPad, iPhone, iPod touch, Nook Color, Nook Tablet, Sony Reader, iriver Story HD, Kobo, Android phones, etc. 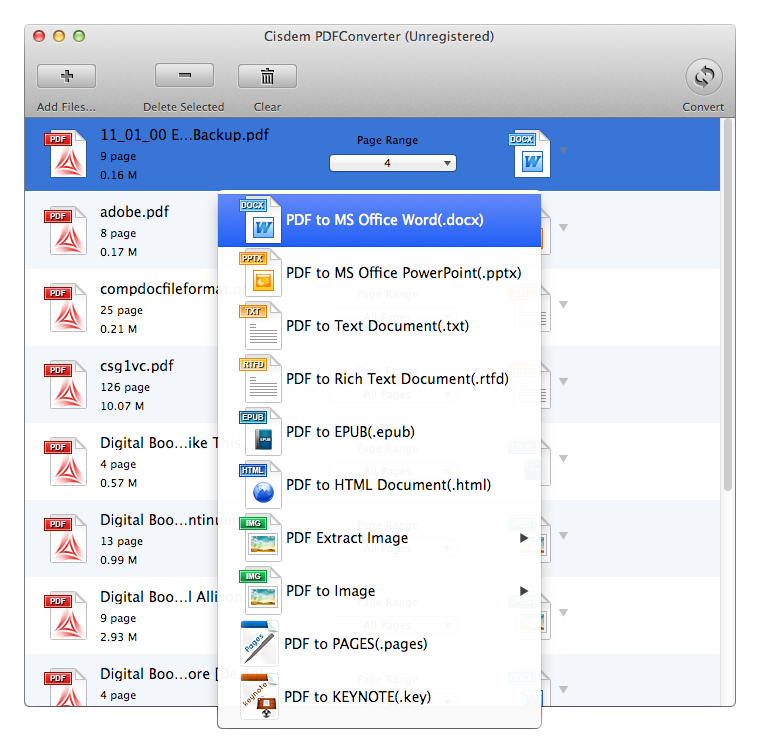 Convert PDF files into fully editable Keynote and Pages file types. This app intelligently builds paragraphs, creates tables and regroups independent graphics to re-create the intended layout of the original file. Convert PDF to Image: JPEG, PNG, TIFF, GIF and BMP format. Image quality and resolution can be adjusted when you convert PDF to image. Extract all pictures in PDF document and convert them to images in JPEG, PNG, TIFF, GIF and BMP format. Gives unique logical names to the image files so that you can easily relate the images back to the document. Images are saved in their original resolution and their true colors. 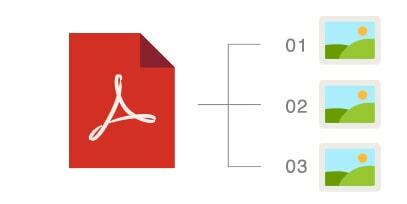 Batch Conversion Mode: Help you convert up to 200 PDF files at one time, save your time. Partial Conversion Mode: Convert any particular pages (e.g. 1,5-10,21 or all pages) to save your time. This version of PDFConverter supports importing scanned PDF files and converting them, but the converted files are not editable. If you want to convert the scanned PDFs into fully editable word, text, etc. please turn to Cisdem PDFConverterOCR. - 1G Hz or above Intel processor. - 512 MB physical RAM (memory) or more. - 1024×768 or higher resolution display. 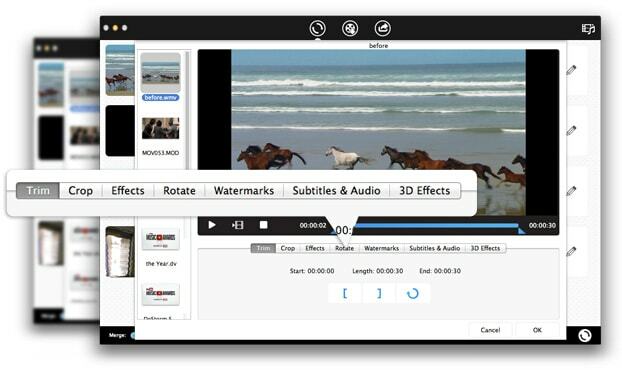 iSkysoft Video Editor for Mac is a popular video editing software with versatile functionality and friendly usability. In addition to editing MOV and other video in different formats easily, users can easily add some cool video effect into the videos. They can add background music and adjust the brightness, contrast and remove video noise. Just go on reading and learn more about the MOV Editor Mac. Fully compatible with major Mac OS X Mavericks, Mountain Lion, Lion, and Snow Leopard. System Requirements: Mac OS X 10.7, 10.8, 10.9 Mavericks, 10.10 Yosemite and 10.11 El Capitan. Voilabits PhotoSlideshowMaker is a fun and reliable tool which enables you to create stunning slideshows with local and iPhoto pictures, local and iTunes music, recorded audio, pure color slide and transition effects; modify pictures by adding text and filter effects, cropping and rotating; edit existing slideshows; and then save as any video & audio formats for different usages and devices. You can even create a DVD and burn it onto a DVD with various DVD templates. Used as a DVD Creator, it can create a DVD and burn onto a DVD with stylish free DVD templates. Fully supports HD: export to slideshow movies with high resolution of 1920 x 1080. - Mac OS X 10.6 Snow Leopard, 10.7 Lion, 10.8 Mountain Lion, 10.9 Mavericks, 10.10 Yosemite. Recover deleted pictures / images, audio & video files. Repair & restore corrupt JPEG & JPG images. Improve the performance of your Mac and make it run like brand new. Create exact mirror image of Mac based volumes. Software to help defragment Mac drives to optimize performance. Convert Image files from one format to another. Like PSD to JPEG etc. Real time health monitor for your Mac drives. Easily locate, open & remove desired files with this superb pathfinder.